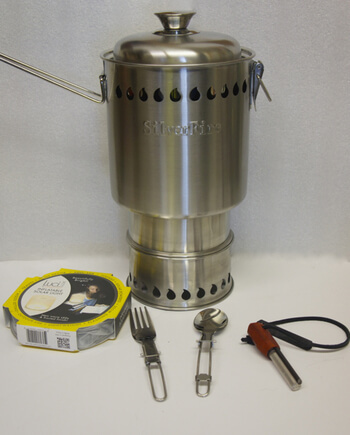 Includes advanced 2 liter skirted pot, SilverFire 304 SS Scout Stove, 2 stainless steel folding forks & spoons, firestarter & solar lantern in one kit! Configuration #5: New Summer 2016! The Ultimate Brushed SS Scout with 5 pot supports and New Mini 2 Liter Dragon Pot with Everything for off grid cooking two! The weight of the pot alone is 20.4 0z (1 lb 4.4 oz / .578 Kg), not including kit options. 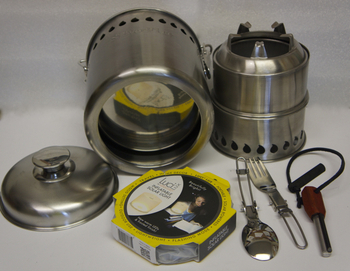 Includes Ultimate Brushed 304 SS Scout Stove, New Mini 2 Liter Dragon Pot, 2 sets of SS Folding Utensils (for 2! 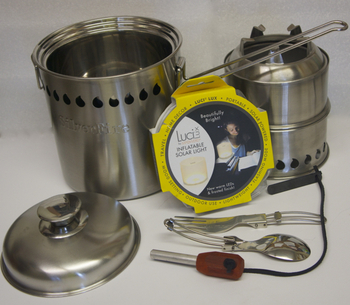 ), fire starter, stove bag, and large 50 Lumen Frosted LED Solar Luci Lantern! The Brushed 304 SS SilverFire Scout Stove has 5 pot supports, nesting Fire Starter, 2 sets of Folding SS Fork & Spoon inside black nylon stuff bag. The Luci 50 Lumen solar lantern can ride below or on top of stove inside Mini Scout Dragon Pot. The entire Ultimate Scout kit for 2 nests inside Mini 2 Liter Dragon Pot! A $208.95 value now on sale! 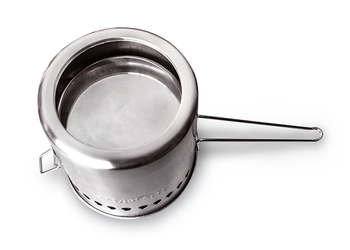 The New Mini 2 Liter Dragon Pot serves as a wind screen and maximizes heat transfer to pot by heating both the walls and bottom of the double clad skirted pot. This results in a significant reduction in emissions, fuel use and time to boil, which can be critical in the field or emergencies. 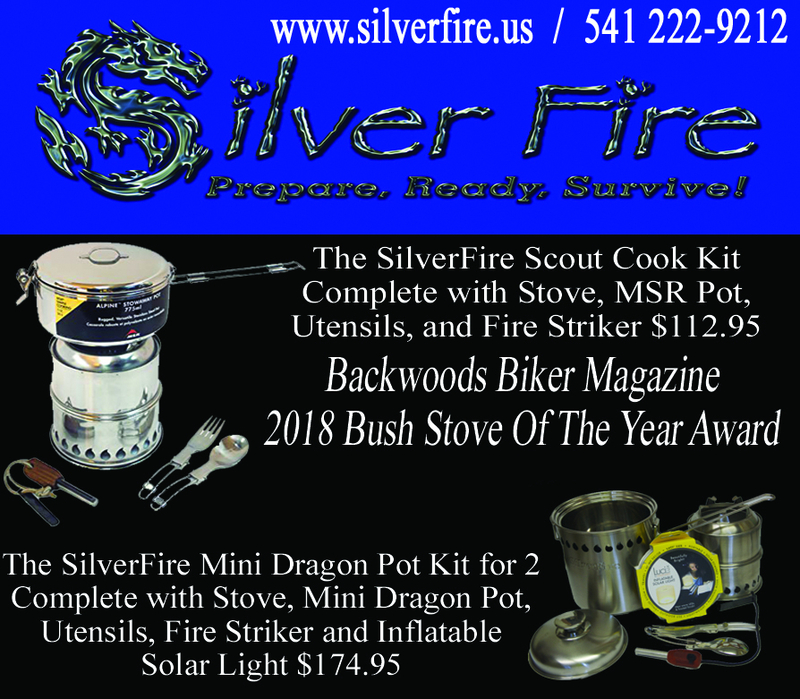 As mentioned, the Strike Master Survival Fire Starter and pair of Stainless Steel Forks & Spoons nests inside the SilverFire Scout stove, which nests inside Mini Scout 2 Liter Dragon Pot with locking carry handle bail! 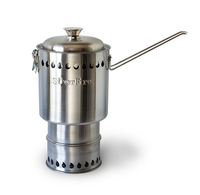 This complete field stove / pot cooking combination for 2 could save lives in the field! Our Brushed 304 SS SilverFire® Scout is an ultra lightweight wood fired gasifier stove with 5 pot supports, that operates on twigs or flammable biomass. 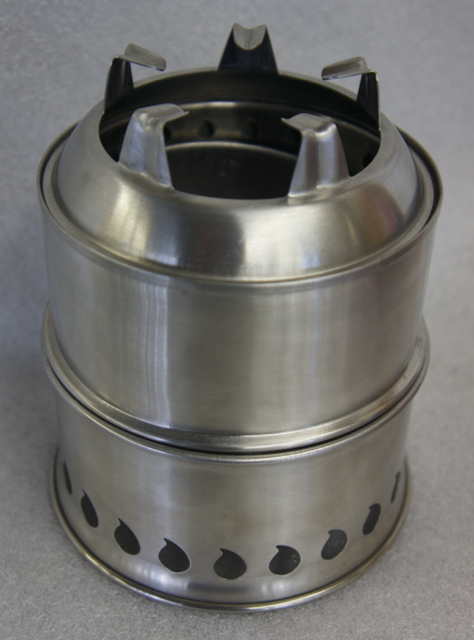 An alcohol canister can also be inserted in Scout Stove for indoor cooking. Dual Scouts Burning at Night! 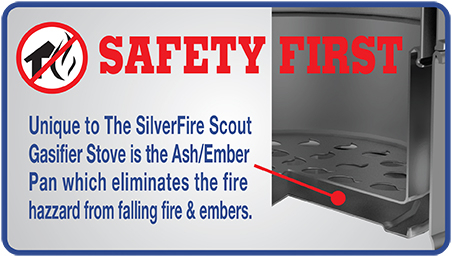 Warning: Buyer's beware, only the SilverFire® Scout has a safety ash / hot ember plate attached below the combustion chamber and our flame shaped ventilation holes in our custom patented design. The Internet displays numerous cheap Scout knockoffs, that do not include our SilverFire® Scout plate design, which is a huge safety liability and may result in igniting a fire outside the stove! These knockoff stoves are easily identified by round or square shaped ventilation holes, and do not exhibit our SilverFire flame shape motif! They also do not utilize our new improved pot supports for greater safety and durability. Buyer Beware! Finally the perfect TLUD* compact stove for backpacking or bug out bags for 2 with the Mini Scout Dragon Pot. This all stainless steel stove's state-of the art design blends practical technology, durable materials, safety, and ease of use. The compact Scout stove kit and LED lantern nests inside the rugged Mini 2 Liter Dragon Pot perfectly for travel. It is the must have companion for cooking for 2. Our simple modular nesting stove is the diameter of a CD and the profile is only 2 & 1/2" tall when collapsed and stowed in our nylon bag. The Scout TLUD is a leading compact gasifier stove design (vs bulkier Solo, BioLite, Bush Buddy, & Wood Gas stove options). 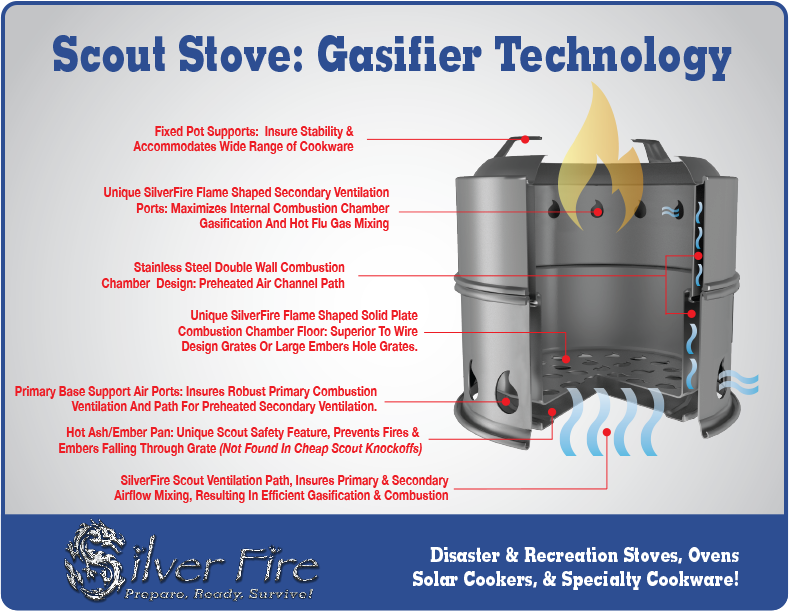 While other nesting gasifiers maybe appear similar at first glance, only theSilverFire® Scout has a protective ash plate below the combustion chamber floor, to insure safe operation and control of live embers and improved pot supports. Insure you are ordering the stove with our easy recognizeable flame shaped ventilation holes. Knock off nesting stoves with square or round ventilation holes do not incorporate our important safety ash plate design found below the combustion chamber and allow large live embers to droop through bottom of combustion chamber while cooking! Our simple stove design does not use fragile spring wire pot support system that can leave your stove inoperable in the field. We use a refractory stainless steel grate floor, not wire. Wire grate combustion chamber floors are fragile compared to our stainless steel plate floor. We have no thin wire in our design that can snap or break. We our receiving reports from owners of stoves with wire grates that snapping and failing in the field when fuel is inserted into the combustion chambers or during cleaning. Fortunately they have been able to replace their stove with our superior, simple, and more compact design. 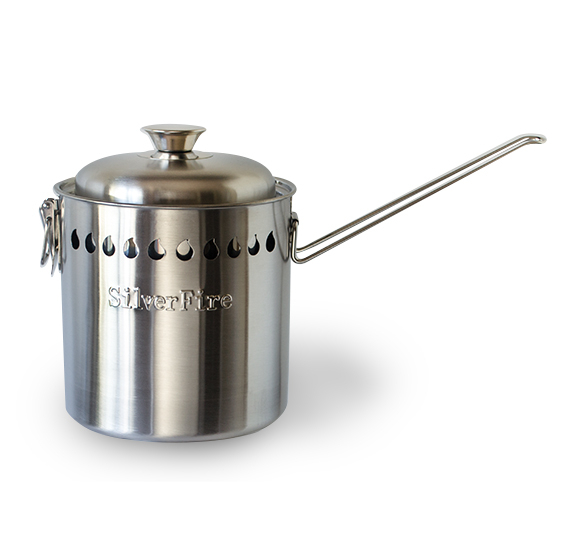 The SilverFire® Scout & Mini 2 Liter Dragon Pot is designed for backpack cookware and small pots. Buyer's beware, only the SilverFire® Scout has our safety ash plate and flame shaped ventilation holes in our custom patented design. In the event a stove does not meet your expectations, please return it to us and we are happy to replace it. Clean burning gasification is provided by natural draft ventilation. The stove produces high heat for a twenty minute burn with a single load of ordinary twigs. Longer durations are possible with more fuel, or denser hardwoods. There are no moving parts, no electronics, and a zero post-manufacturing carbon footprint. Unlike other wood burning stoves, the SilverFire Scout nests together inside the the Mini 2 Liter Dragon Pot, and quickly assembles into a robust cooking platform for 2. Strike Master Survival Fire Starter: This custom size survival fire starter was designed specifically for the SilverFire Scout, but is the perfect fire starting tool for all of our SilverFire stoves. It nests in the bottom of the Scout combustion chamber and is good for thousands of strikes (save money when purchasing the SilverFire Scout, Mini 2 Liter Dragon Pot, 2 sets of ss utensils, 50 Lumen Solar Lantern, and Survival fire starter together). The safest and most dependable fire igniting tool around. Performs well in wet conditions, cold temperatures, and high elevations. Hold scraper at an angle to the rest of the fire starter. Slanted forward. If scraper is lost, a knife, broken glass, chipped rock or any hard sharp edge will work in it's place. Tinder includes, moss, dead grass, pine needles, leaves, wood shavings, steel wool, cloth, paper, etc. Returned SilverFire products subject to 25% product restocking fee and all shipping costs are non-refundable. A tracking number is sent to your provided email entered at the time of order. The tracking number is generated at the end of each business day after carrier scans package (Monday through Friday). Please refer to email for tracking number. There is no ground service on weekends. Always feel free to call with questions 10AM - 5:30PM Pacific Time Zone, Monday through Friday regarding our products. We are also usually in on Saturdays 10AM to 2PM, unless participating in a trade show or other business activity.Questions?